Oh man, I am so tired, but such are the trials and tribulations of parenthood (especially with a baby). Regardless, I have been working on my goal of trying to match patterns to yarn (both already owned - or in the case of patterns, if not owned then at least free or available from the library). Let me tell you, it has been HARD!! I am very much a person who loves organization and planning. Have I ever told you that I'm a teacher? Well, I am (though currently on maternity leave) and in my job if you're not organized, you will SINK... big time! I'm always making myself lists (and including things I've already done on them; a great little trick if you ever feel oppressed by a mountain of things to get done). But, I digress. Back to the point! It has been difficult linking the yarn I own to patterns I would like to knit, and I think I know why. Knitting isn't just something to get done, it's a creative process! And part of that creative process is the yarn in and of itself. I truly feel that every yarn has a pattern that is just meant for it, and that pairing can't be forced. I'm sure that anyone who's ever created something can say the same, sometimes a certain medium is meant for a particular project. So, needless to say, to attempt to pair ALL (or even a great deal) of my yarn with the RIGHT projects is a great task! But, the process hasn't been in vain. I've decided to just come up with a few yarn-project pairings at a time, and to be flexible in changing them if the fit doesn't seem right. I know this seems like reverse logic, but a few weeks ago when I was trying to keep myself from going to the latest Beehive sale, I started thinking about any knitwear I might have that just doesn't get worn, and these were the two that I came up with. 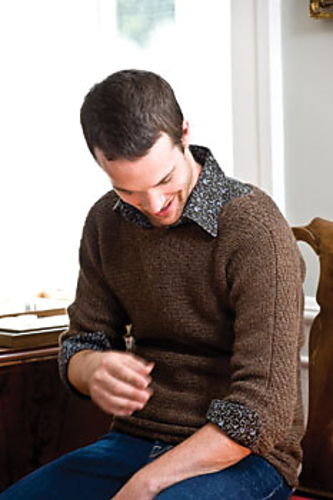 The Aran sweater that I made for my hubby is just an overall horrible design. Even though I did a gauge swatch, it still turned out way too large, and the shaping of this sweater is just non-existent. It reminds me of those boxy sweaters guys used to wear in the 80's... blah! As for the sweater/jacket that I'm wearing, it is a GREAT piece. I actually really love it, but the fact remains, I never wear it! I think it's a combination of our rainy climate in Victoria, BC, and the fact that I held the yarn doubled when I knit it. I know, DOUBLED! Anyone who's ever worked with Eco wool knows that it can be used as a bulky weight yarn, but at the time when I started the project, I was a fairly fresh knitter and was advised by the lovely staff at my LYS that it was a lighter weight and hence should be held doubled. This resulted in a really stiff fabric which I attribute as one of the reasons why I never wear it. Well, what do you think? I still need to decide which colours to use for which projects. Suddenly, I'm really excited! This article was originally posted on http://ayeartoexpand.blogspot.com/ Any reproduction on any other site is prohibited and a violation of copyright laws. I know exactly what you mean about trying to pair up yarn to pattern. Even though I have a pretty good list going, I can't do it with all my yarns. There's no telling what my tastes will be like when I finally get around to knitting that yarn up! I've also been re-claiming yarn from past projects. Although, mine aren't from FOs. Just projects that I have started knitting, abandoned for something either quicker or better (or both!) and now realize that it's just not something I'd wear. It's actually quite gratifying to come to the realization that you're making a garment that you'll never wear (or, in your case looking at something knowing you're not going to wear) and frogging the whole project. Yeah, I got the idea from Jennifer and all the projects she's made from yarn reclaimed from commercially made items (that amazing cashmere shawl and now the Dahlia that she's working on). I must admit, when I finally made up my mind to rip those FOs, I felt really good about the whole thing. I'm just really excited about getting some "free" yarn! No wonder you're excited! I love the Eco Vest and think it would look great on you. Either colour would look good, although I would choose the light one for you and the darker for Max for the pull over. Hey you, just a heads up that the woven bands pullover ends up being a 3/4 sleeve boatneck! The photo is styled in such a way that this has tricked several knitters, it could be modified though! thanks for the heads-up! I definitely did not realize that from looking at it and I don't think Max would appreciate the 3/4 length sleeves. PS - I also ordered wool online last week, despite trying to "cut down" on wool purchases. I needed it. (Can you see the invisible quotation marks in that sentence? As a hint they surround the word that rhymes with beaded, heeded, and expensive). 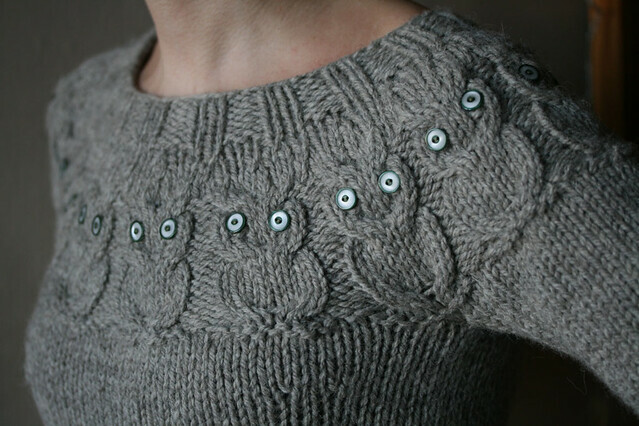 good plan to unravel knits that aren't being worn and re-use the yarn. i love eco wool and i hope to use it again soon. last fall i made an aidez with it and i highly recommend that sweater - i want to make another soon!